What Is A Diverter Valve & How Do They Work? In most properties, there is more than one bathroom with the master bedroom having an en-suite and any guest bedrooms usually have access to their own washing facilities. As a result, there is a very high chance that you have a shower diverter valve installed somewhere in the building. So what is a diverter valve? There are two main types of diverter valves available for residential properties. These are called Tub Diverter Valves and Showerhead Diverter Valves. For the purpose of today’s article, we’re going to focus on the roles of the showerhead diverter valves and how they work from day to day in a standard residential home. Before you begin, its worth laying all of your parts out so that you can see exactly what you have available. Make sure that you’re organised to make the installation run as smoothly as possible. First, you’ll need to remove the existing showerhead. Over time it may become tight so you might need to use a wrench to help prize it from its fixings. Now that you have the old showerhead off, you can fix the new diverter valve into position. You will need to screw the diverter to make sure that it’s secure. Remember to make it tight to prevent water leaks and a loss in water pressure. When you have secured the diverter valve into position, you can start to re-install the showerhead. Place the showerhead over the diverter valve and secure it in place. Again, make sure that it has been done correctly and tight to prevent leaks. Now that the showerhead has been installed onto the diverter, you’ll need to fit the handheld showerhead into position. Use the same process here. Place the handheld showerhead over the valve and secure it into position. You can then test the diverter and showerhead by running water and switching the valve. As you go through this test, neither valve should leak. If you’re doing your shopping, you’ll notice that there are predominantly three types of shower diverter valves. These are the three-valve diverter, two-valve diverter and the tee diverter. We’re going to go through each one now so you know exactly what each diverter valve will be used for in the future. You will find a three-valve diverter installed on most two-tap faucets. The three-valve diverter is what you will find installed in most residential properties and showering rooms. The role of this type of diverter is to use the hot and cold faucets to get the temperature of the water at a comfortable level before diverting the water through the valve and out through the showerhead. 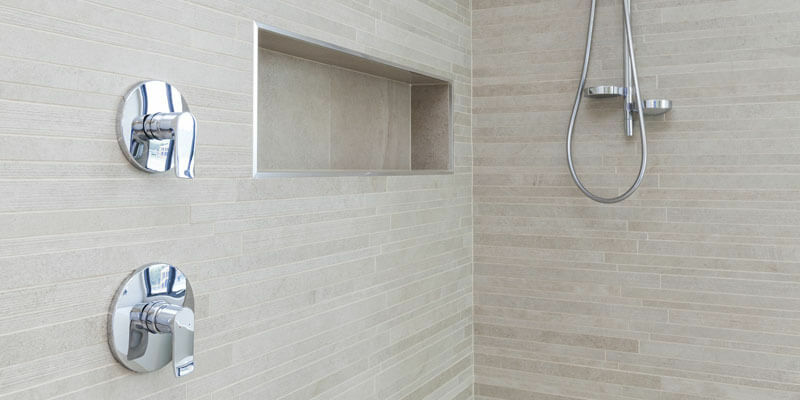 When you have finished using the shower, you can switch the diverter off and return it to its original position by turning it counter-clockwise. 90% of two-valve diverters are fitted using two “L” shaped valves that can be found in the centre of a standard faucet. A two-valve diverter will typically adjust the temperature of the water with a single dial located between the two temperature taps. Two-valve diverters are found in older properties that have a tub and shower installed as one. The two-valve system allows you to redirect water from the tub directly to the showerhead. A tee diverter is less common but is still frequently installed in some properties and can be found installed as part of the tub spout. It is a simple straight pulling handle that directs water to the showerhead only. When the shower is no longer in use, you simply push the tee back down to stop the water from running. In an effort to reduce stress and wear its advised that you allow the water to run through the valve after use before switching it off immediately. It’s heavily advised that you adjust the temperature setting before standing in the shower or tub to prevent scolding. If you ever notice water leaking from either end (showerhead or spout) you will need to contact a local plumber in Towcester to assess and potentially replace the valve.